Almost a month has passed since PC Expo, and looking back it was quite the adventure. After looking around at the various exhibits and attendees, it seemed to be more like "Palm Expo" than anything else. 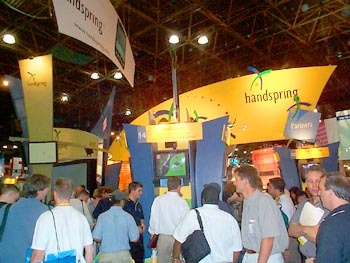 Palm and Handspring had fairly large booths and several building banners outside the Javits Center. Inside, I didn't see anyone walking around with a Windows CE device except in Microsoft's booth - everyone had Visors, Palms, or Blackberrys. Both Palm and Handspring had very catchy videos and presenters - I want the new VISOR shirt! Elsewhere in the show, the thing that caught the most attention was CRN having various attractive women wearing tees that said, "Here's your chance to pick up an 18 year old." Truth be told, I did see a few guys wearing the shirts as well. Handspring certainly didn't need to rely on looks to get their products known. Their area was packed almost all day, with many of the attendees checking out the various Springboard modules. Marcus and I will now give you our impressions of what we saw at the show. Please remember that these are only impressions and they could change once we fully review the products. James: The biggest trend that I saw was the emphasis on content. Jeff Hawkins alluded to it in his keynote, and after seeing the Geode and the various wireless modules, content is once again "king." James: Yes there were some disappointments. I'll reserve judgment for when I get my hands on it, but the HandyGPS paled in comparison to the Geode at the show. Lower accuracy and limiting maps to available memory are severe drawbacks to the HandyGPS. It's mapping software did seem nice, however. Marcus: The wireless Springboard modules look promising, but why are they so large? I understand there is a lot of complex technology in them, but as comparison, look at today's advanced cell phones. Some cell phones are smaller or about the same size as the Minstrel S module, but the also have a keyset, speaker, and display! Maybe Handspring can build a universal antenna into the case of future Visor models (like some Nokia phones), and let modules access it through the springboard slot. James: I'm not too concerned with the size of the wireless module as long as it connects quickly. The @ctiveLink took only a second or two to connect, but the other modules took longer. Marcus: The show floor's wireless network had heavy congestion during the show, which increased connection times. Speaking of cell phones, one of the neatest power solutions we saw was Xircom's SpringPort family. They use the same Lithium-Ion battery pack as the StarTAC, so users can swap between the two or buy packs of different sizes anywhere. James: Looking at another trend, I'm glad that the MiniJam and the FM radio modules will come with earphones, keeping me from having to buy them separately. Marcus: The one-way wireless technologies (InfoMitt, CUE Radio) look promising because of their very slim form-factor; however the service fees (and lack of unlimited plans) are not that much lower than full-featured two-way wireless modules. James: That's interesting, because I saw the fees for the InfoMitt and the CUE Radio as reasonable. You may want to read all of your email on your Visor, but I just want the important stuff right away. Besides, the modules cost much less than the two-way modules.